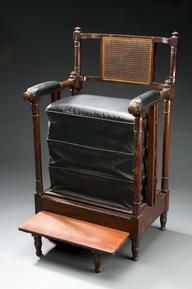 Physicians experimented with iodine to treat tuberculosis during the 1800s. This is a dangerous infectious disease that usually attacks the lungs. 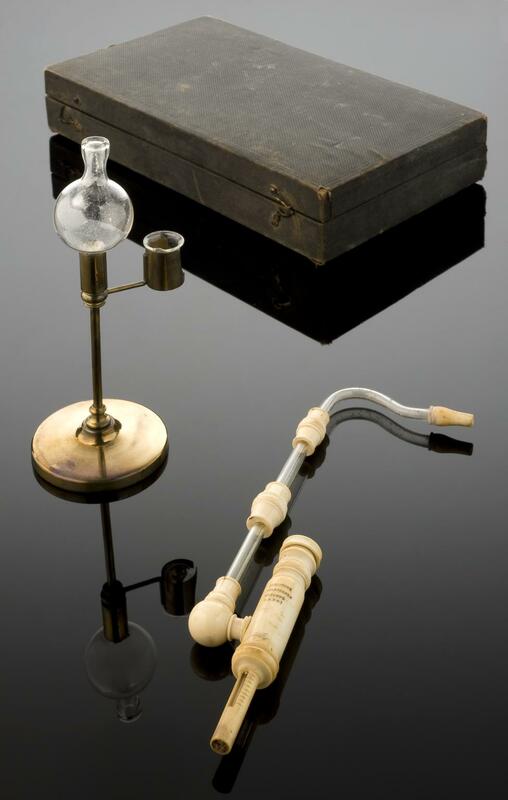 This iodine treatment apparatus was developed in France by Dr Chartroule. The medication was placed in the glass vial and inhaled via the long ivory mouthpiece. Dr Chartroule trialed his apparatus on 28 patients with some success: 17 had a perceived improvement, but 11 saw no benefit. Symptoms of tuberculosis include a chronic cough with blood-tinged sputum, fever, night sweats, and weight loss. Treatments were limited during the 1800s. However, inventions such as the stethoscope to listen to the chest (1816), and the X-ray machine (1895) helped diagnosis. The development of the BCG vaccine in 1921 helped control the disease.